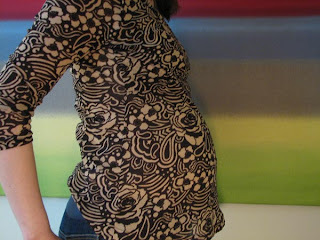 At 27 weeks (that's almost seven months for the math-challenged), I've reached that point of the pregnancy when I need to stop looking for the perfect pair of black maternity pants and start thinking about how to feed, entertain, clothe and transport Sprout. The book is just over 500 pages long. Rodney read The Great Gatsby in the time it took me to get through the crib chapter, which runs from page 15 through page 112. At the end, he could offer me a treatise about F. Scott's Fitzgerald thoughts on the American Dream. I could only tell him if you can stick a soda can through the crib slats then your baby's head can fit through, too, and that's bad. Boppy. Exersaucer. Binky. Diaper Champ. Pack 'n Play. Five-point restraints. Sleep sack. I feel as though I've been assigned to go on a mission to Mars and I'm supposed to pick up supplies for my journey at the NASA warehouse--there's so much stuff out there and I'm not sure what a lot of it is! I feel great consternation when I look at this 10 cm image. On the one hand, I can't believe anything in my body can get that wide. On the other hand, I can't believe that exit door is large enough for a baby. Susie, the dynamo nurse who runs our Tuesday evening childbirth class, assures us that 10 cm is enough. "The smallest part of a baby's head is the crown," she says circling the top back part of her skull. "That's the part you hope heads down the canal first. If the child descends face up," she pauses, "that's a little trickier." I certainly hope Sprout has better head:cervix coordination than I have hand:eye coordination. Otherwise, this birthing thing could be tricky.